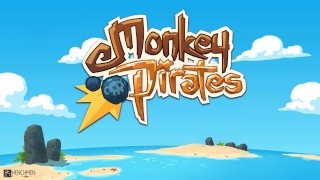 Monkey Pirates is a fast comical topdown multiplayer action game for up to five players, a rapid-fire cannonball contest against your friends in a variety of customizable modes. It's welcoming you with a nice hand-drawn Carribean setting and a pretty Monkey Island-like title track, so there's definately a good atmosphere from the get-go. One thing straight ahead: The game always takes place on the tv screen. The GamePad can be used for navigating the menus, and it works as a controller in singleplayer. For multiplayer though everyone needs a Wiimote. The GamePad is also needed for the five-player Sea King mode (but more on that later). You see your ship from an overhead zoomed out view and steer left and right to turn around. Unfortunately there's no casual control (press up to move up, press down to move down, etc.) I know a lot of people that have trouble with left/right steering from a topdown perspective. For this reason they couldn't get into the game. Other than that the controls are fairly basic with one button firing the cannons from the front and the sides, and the other button casting the anchor which makes cool drifts possible. One of the unique mechanics in games with sailing ships is the wind: There's a wind radar around your ship and its colors indicate the wind strength, and so you have to always keep an eye on it and use it to your advantage which adds a fresh tactical component to the classic arcade gameplay. 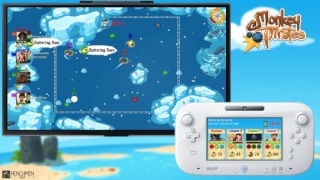 The GamePad specific "Sea King" mode can and should be played with five players. Four players will duke it out like in the other modes, but the player on the GamePad has a special role. He's been given three deeds from which to select one. This deed needs to be fulfilled by the GamePad player to score points. Only then the next set of deed choices become available. A deed can be something like "Player 2 will reach 30 bananas next" To fulfill this deed the GamePad player can select items from his menu and give them to a player. These items need some reloading time before they can be used again. Unfortunately there's not much variety in the choice of deeds. They repeat over and over again just with different numbers. A shame the most interesting mode is so shallow when it has so much potential. Also, sometimes, even when a deed is fulfilled the game takes a while to recognize it which is pretty random and certainly some kind of bug. Speaking of bugs, there is one major bug in this mode, where you cannot fulfill a certain deed when you're playing with less than 4 ships (human or cpu). This definately needs an update. SKTTR's latest European review is now live! He's also reviewing the European release of Armillo as well! 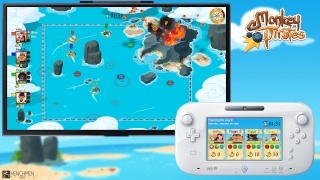 Keep an eye out for both our European and North American Armillo (Wii U eshop) reviews in the upcoming week, but in the meantime let @SKTTR know what you think of his review of Monkey Pirates (Wii U eshop) here in the comments! Great review by the way @SKTTR! It's awesome having reviewers from multiple regions now! By the way do you think could possibly review a Wii VC or WiiWare game that wasn't released in North American as your next project after Armillo? Rukiafan wrote: Great review by the way @SKTTR! It's awesome having reviewers from multiple regions now! By the way do you think could possibly review a Wii VC or WiiWare game that wasn't released in North American as your next project after Armillo? I appreciate the review copies much and do my best giving all games a deep and fair spin. I will se what I can do when I finish up the Armillo review. What EU exclusive games do you have in mind? Any would be great, but I think that you should pick one that's still available and that you feel is a great game that is overlooked by most Wii owners! Nice review, but is this game as good if you only have one or two friends that can play with you during multiplayer sessions? This doesn't sound like a game I would enjoy playing, but nice review all the same! I have zero interest in this game, but the review was still an enjoyable read. I think monkeys should just stay in trees. This is how diseases migrate to other countries. @NINTENBRO82 wrote: I think monkeys should just stay in trees. This is how diseases migrate to other countries. Agreed! This game sounds like a snooze. A barrel of monkeys is better than this. Natsume wrote: A barrel of monkeys is better than this. You mean a barrel of monkeys at the bottom of the sea, right? I enjoy reading your European reviews.